Nothing says timeless sophistication quite like a black + white wedding, and Rena + Andy’s wedding was the perfect example of how to keep this look classic and fresh. Balance is key for high-contrast color schemes like this one. 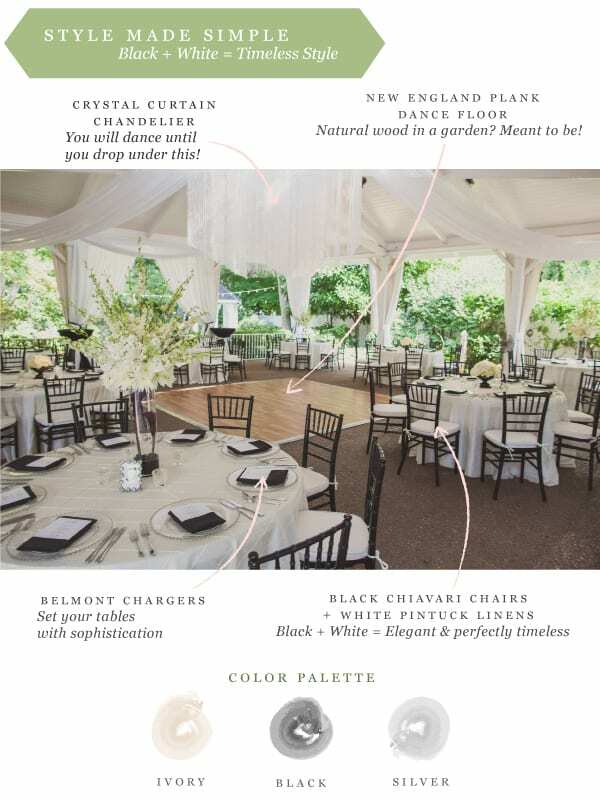 In the image below you can see that the black details – such as the napkins, Chiavari chairs and cocktail table linens – don’t overwhelm the scene because they’re balanced with a lot of clean details, from the pintuck linens and ceiling drapery to the all-white florals. Effervescent details balance the natural ones while the sparkle of the crystal curtain chandelier and the natural wood dance floor work together to create a sophisticated balance. The final look is full of timeless elegance – perfect for the Big Day you’ll reminisce about for years to come!